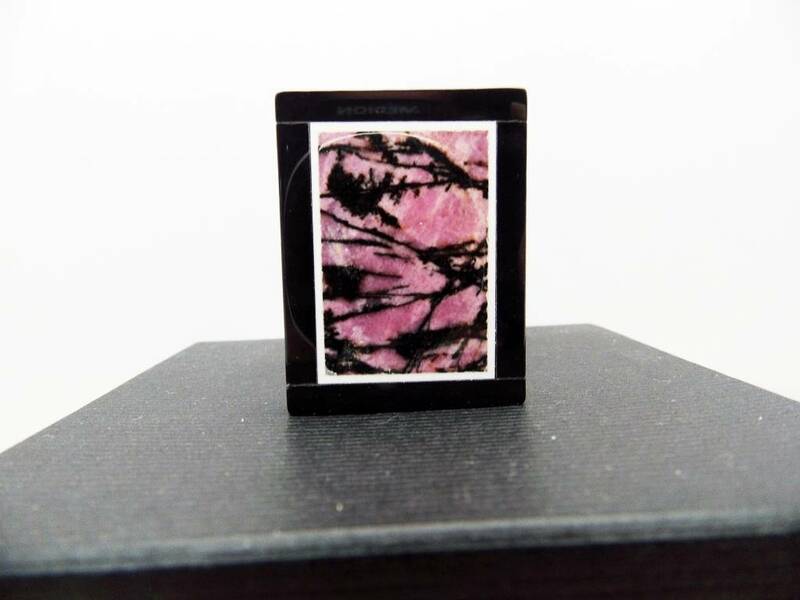 Rhodonite is a manganese inosilicate, (Mn, Fe, Mg, Ca)SiO3 and member of the pyroxenoid group of minerals, crystallizing in the triclinic system. 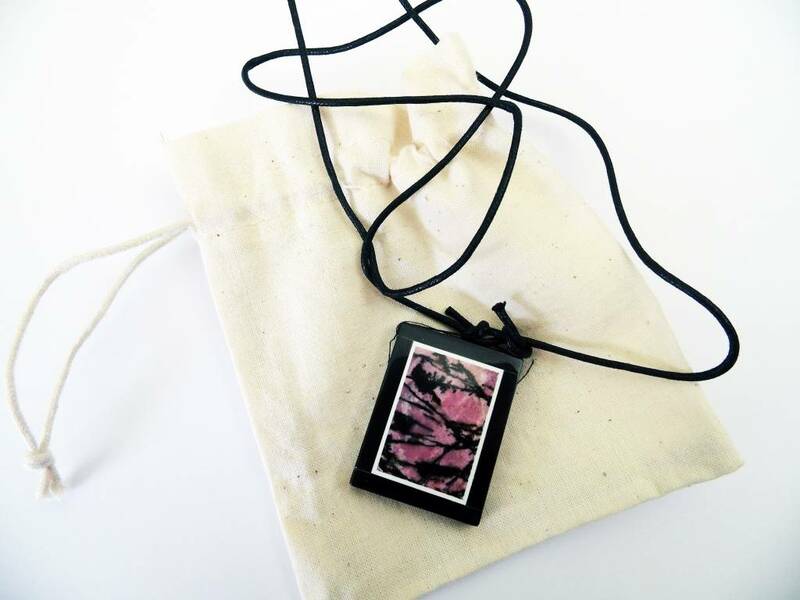 It commonly occurs as cleavable to compact masses with a rose-red color (the name comes from the Greek ῥόδος rhodos, rosy), often tending to brown because of surface oxidation. 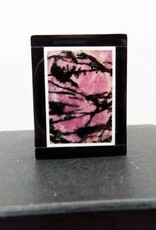 Rhodonite crystals often have a thick tabular habit, but are rare. It has a perfect, prismatic cleavage, almost at right angles. The hardness is 5.5–6.5, and the specific gravity 3.4–3.7; luster is vitreous, being less frequently pearly on cleavage surfaces. The manganese is often partly replaced by iron, magnesium, calcium, and sometimes zinc which may sometimes be present in considerable amounts; a greyish-brown variety containing as much as 20% of calcium oxide is called bustamite; fowlerite is a zinciferous variety containing 7% of zinc oxide. 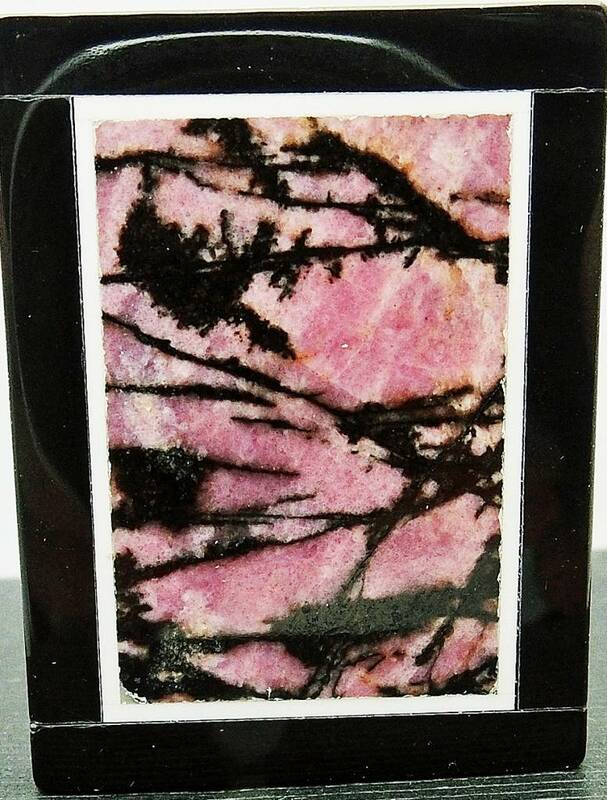 Pink rhodonite contrasting with black manganese oxides is sometimes used as gemstone material as seen in this specimen from Humboldt County, Nevada. 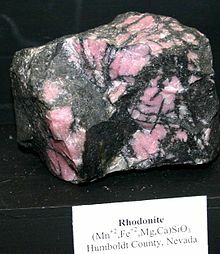 The inosilicate (chain silicate) structure of rhodonite has a repeat unit of five silica tetrahedra. The rare polymorph pyroxmangite, formed at different conditions of pressure and temperature, has the same chemical composition but a repeat unit of seven tetrahedra. 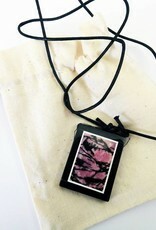 Rhodonite has also been worked as an ornamental stone. In the iron and manganese mines at Pajsberg near Filipstad and Långban in Värmland, Sweden, small brilliant and translucent crystals (pajsbergite) and cleavage masses occur. Fowlerite occurs as large, rough crystals, somewhat resembling pink feldspar, with franklinite and zinc ores in granular limestone at Franklin Furnace in New Jersey. 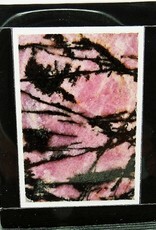 Rhodonite is the official gem of Commonwealth of Massachusetts.